India’s tour of South Africa was always going to be a big test of Virat Kohli and his number one ranked Test team. India’s ranking was achieved largely on the back of a dominant record at home, interspersed with series wins in Sri Lanka and the West Indies. They had overcome strong opposition at home during this time, including South Africa, but an Indian team’s real worth would always be assessed on how they fared outside the subcontinent. 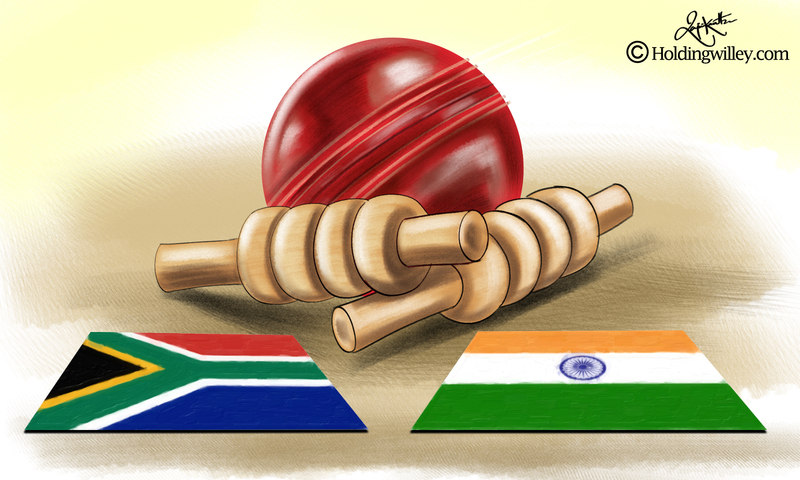 This tour of South Africa, followed by tours of England and Australia, has largely been regarded as India’s best chance of correcting their recent poor overseas record. India arguably have the most balanced and rounded squad they’ve taken abroad, and they came into the series in good form. In the first Test in Cape Town they received a blessing in disguise when South African captain Faf du Plessis won the toss and chose to bat first on a lively Newlands pitch. Kohli wasn’t unhappy to be bowling first, suggesting he probably would have taken to the field had he won the toss. The Indian skipper would have been further buoyed when Bhuvneshwar Kumar made the most of the helpful conditions, as he so often does, to reduce the home side to 12-3. How did it all go so wrong from there? It was a dream start for the visitors, but in a low scoring and rain affected contest they were still thumped to the tune of 72 runs inside three days of playing time. The first, and perhaps most crucial error India made was at the selection table. By choosing Shikhar Dhawan and Rohit Sharma over KL Rahul and Ajinkya Rahane in a batting line-up containing only five specialist batsmen, India left themselves vulnerable against the best bowling attack in the world. Dhawan and Rohit can both be match turning players on their day, but both have struggled outside of Asia in their Test careers and South Africa weren’t about to let this opportunity to dismantle the visitors slip away. Dhawan and Rohit contributed 32 and 21 runs respectively to India’s cause in the whole match. Even more befuddling than selecting Dhawan, and in particular Rohit, was the decision to leave out Rahane to fit them in. Yes, India’s last run of major overseas tours was a few years ago, but Rahane has proven himself to be India’s best overseas batsman. In fact, he has the best average outside of Asia of any Indian batsman. Only two Indian batsmen average more than 50 outside Asia against fast bowling since 2001, and they aren’t Shikhar Dhawan and Rohit Sharma. You guessed it, they are Ajinkya Rahane and KL Rahul. Granted, Rahane had a poor home season but his average in 2017 was still almost 50. And yes, Rahul has struggled with injury and in white ball cricket, but he was one of India’s best against Australia early in 2017. Meanwhile Rohit Sharma has just the three Test hundreds, all at home, where he averages 85. Away from home he averages a paltry 26. Picking him purely on his white ball form and runs against a very weak Sri Lankan side at home was a poor decision that played a large part in India’s first Test defeat. The manner in which both Dhawan and Rohit fell in each innings displayed their lack of temperament to play against the fast, moving ball in conditions that test the technique and character of batsmen far more adept than the Indian pair. Indian fans will be hoping the team management learns from their mistakes in time for the second Test and makes the necessary changes to the selected personnel. The ability to change a match over the course of a session is overrated if the batsman tasked with the job can’t last a session to begin with. The second area in which India let the game slip was an area that has cost them in the past – their ability to clean up the tail. In South Africa’s first innings, the Indian seamers did bowl well, but they were also guilty of giving away far too many boundary balls. At 142-5 and Vernon Philander coming in at 7, India would have been hoping to wrap up the South African innings for around 200, maybe 220 at a stretch. Instead they allowed the Proteas to get away to 286 and the last five batsmen – Philander, Keshav Maharaj, Kagiso Rabada, Dale Steyn and Morne Morkel – contributed 102 of those runs. On a pitch that was offering plenty of assistance to the Indian seamers, who had first use of the conditions thanks to du Plessis, they should have restricted the home side to far less. In the end, it was the home attack who showed the Indian bowlers how to use the surface, even if India had the better of the conditions, and tore apart the Indian line up to win the game by 72 runs. India’s bowlers did fare better in the second innings but that first innings proved to be costly, and those lower order runs by South Africa were match defining. To win the second Test and get back into the Freedom Series, India first needs to select their best side. Then they need to make sure they capitalise when they are on top, because those opportunities won’t always come against a potent South African side in their own backyard.